Are you searching for roofing in Bellmead, TX that is cost-effective and dependable? For dependable roofing, you can call on ECO Commercial Roofing at (833) 200-0571 to save the day! Customer service is a number one objective of ours, and we can provide you with almost any type of roof assistance you may need. We are participating members of our communities, and we have been reliable Bellmead roofers for a quite some time. Our roofers are extremely knowledgeable on the various kinds of roofing, and we are happy to assist you with any of your roof questions or concerns. Whenever you are searching for a better roofing experience, call the professionals at ECO Commercial Roofing for help. Your roof plays a significant role in defending your house, so it’s of the greatest importance that you employ a contractor you can trust. We make sure that all of our roofers are taught to the industry standards, and we solely buy materials from contractors we can trust, such as Conklin. Because the kind of roof you install can affect the value of your property in years to come, we make sure to carry large varieties of materials and styles for you to choose from. When picking, keep in mind that while the look plays a significant role, that the extended benefits also require careful consideration. The type of roof you pick will ultimately rely on your budget, and the kind of building you are needing to protect. Luckily, our team can provide you with tons of options. Reliable roofing services are our primary objective, and we can provide that in the form of repairs, replacements, and installations too. Our expertise allows us to service any kind of roof, including commercial, industrial, and residential too. When you own a business property with a traditional style roof system, our commercial services might be the services best suited for your needs. When you need your flat roof to endure without any further issues like leaking or ponding, special installation will be required. Industrial roofs, though similar to commercial roofs, actually require stronger materials, and extremely skilled installation to guarantee longevity. Ultimately, we also offer reliable and affordable residential roofing services in a wide variety of styles. Each roof company has a specialty, and ours is roofing restoration along with roof coatings. In our expertise, using top quality materials such as Conklin can truly mean the difference between the roof coating that lasts, and one that doesn’t. We’re committed to supplying our customers with only the greatest roofing in Bellmead, TX, and we deliver that with unbeatable craftsmanship, time after time. To find out more about our Conklin roof treatments, or to ask questions about our roofing restoration methods, give us a call at (833) 200-0571! Roof restoration is a superb way to improve the overall surface of your building’s roof, while also avoiding future damage. Utilizing Conklin roof coatings, our crew of experts can provide an additional decade to the life of your roof! Save yourself time and cash by choosing a reliable roof restoration instead of a roof removal and installation. The bulk of our roof restorations are completed utilizing Conklin’s top quality roof coating products. It can be hard to decide which roof coating is ideal for your needs, when presented with the wide variety of options, but our professional roofers are here to help! When picking a roof coating, we consider the original material of the roof, along with the types of damages that roofing may be sensitive to. 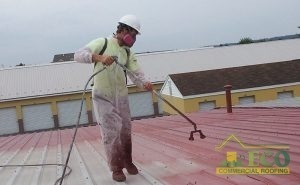 In most cases, the roof coating is installed directly to the former roof’s system. To discover if your roofing is eligible for a roof coating, contact us now at (833) 200-0571! Acrylic Roofing Alternating temperatures call for reliable roof coatings such as acrylic, which are very flexible. Elastomeric Roofing Elastomeric roof coatings come in a variety of types, and are an affordable way to protect your roof. Our flat roof services are designed to help out various different types of commercial roofing, including low-slope as well as flat roofs. If you are hoping to skip issues with your roofing, it is critical to start with a high quality installation. If you want your roof solution to work efficiently, and last for a long time, our contractors are here to assist you. Contact ECO Commercial Roofing when you require residential and commercial roofing service you can depend on to protect your roof system for years to come. 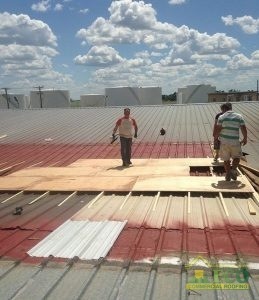 Our professional roofing in Bellmead, TX is additionally available in the nearby areas. An investment in a fortified roof is an investment in your business that you will not regret! Dial (833) 200-0571 with your questions, and let us know how we can best help you!